I am constantly amazed by kids. I stand in awe of my daughters' energy, imagination and dreams. Not that kids aren't a total challenge and more work than we parents could have ever imagined, but they are our future aren't they? They are our future doctors, teachers, mothers and fathers that we must place our trust in to lead our country to a prosperous, healthy and sustainable future. Kids like 11 year old "Eco" Erek aren't waiting until we adults give them the reigns, though, they are making their impact felt now. 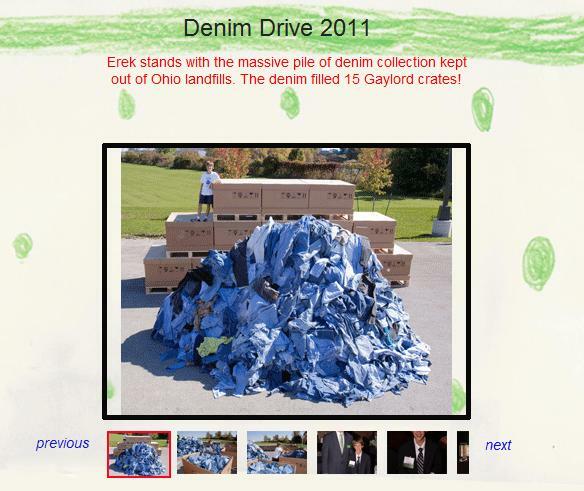 Inspired by an article in National Geographic Kids, EcoErek, who lives in Ohio, began holding recycling drives to collect denim for recycling in 2009. All the denim he collects is donated to Cotton. From Blue to Green ® and manufactured into housing insulation that goes to communities that have been struck by natural disasters. To date, EcoErek has collected nearly 10,000 pairs of used jeans and other denim pieces that have been used as insulation. This year, EcoErek kept not only 3,920 pairs of jeans out of landfills, but he also recycled 3,000 pairs of shoes in a partnership with USAgain. USAgain agreed to pay EcoErek $1 for every pound of shoes he collected and they also donated $5 for every $1 Erek raised from the shoes through his collection program. The money raised will be donated to a non-profit chosen by EcoErek, which happens to be one of my favorite non-profits as well, called Project Kaisei. Project Kaisei is committed to increasing awareness of huge problem of marine debris, its impact on the environment, and the solutions for prevention and clean-up. I actually got the sniffles and shed a couple of tears as I watched some of the slide shows on EcoErek's site. It struck me as I looked at the pictures of his recycling drives, that in his quest to help our planet, Erek is also helping those around him immeasurably. This year and every year, EcoErek is giving the gift of "making a difference" to those in his community. And when you feel like you have made a difference, you feel like you matter. We all need to know we matter. I hope you feel inspired by Erek's story like I was and that you will follow along with him on his website at www.EcoErek.org or catch up with him on his fanpage. I have a feeling we will all be hearing more about this amazing young man, and many other great Eco-kids, in the years to come.